From the APMG website: CPTC validates the skills, knowledge and competence of technical communicators as they advance in their professional careers. CPTC is a certification scheme developed by APMG on behalf of the Society for Technical Communication (STC). The Society for Technical Communication is the world’s largest and oldest professional association dedicated to the advancement of the field of technical communication. The Society, with headquarters in the United States, has members in over 40 countries and across all continents. Objective validation of technical communication competency. Enhanced employment opportunities as you can differentiate yourself from others. Indicates to your existing or potential employer that you are committed to the field of technical communication. 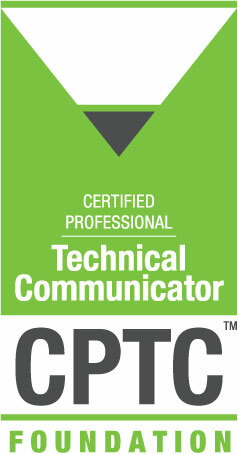 I am an Accredited Trainer for the Certified Professional Technical Communicator (CPTC™) exam. I’m available through both the Rochester Institute of Technology and individually to provide a 12 hour training course followed by the CPTC exam. I’m also happy to refer you to a fellow trainer if that meets your needs better. Excellent style and put us at ease. Really gave us very useful test taking advice and prep. One of the best instructors ever. Able to hold my sleepy-ADD mind for a day and a half on a weekend while making me retain info. Kudos! Ben did a fantastic job running this class! He made it clear from the start that this class complements, does not replace, the text. But I feel I have a better understanding of what to expect on the exam. Contact me about the CPTC!